Hooked to an IV, Zhu Qingli sat on a wooden bench and watched television in an outpatient room in a small hospital deep in the Chinese countryside. The 28-year-old, wearing a basketball jersey and shorts in the purple and gold of the Los Angeles Lakers, was getting treatment for bronchitis. His once-heavy cough was gone and he was feeling much better, but he still needed a few more days of antibiotics. The hospital was primitive by U.S. standards, with cracked concrete walls and ill-fitting doors in the outpatient room. But the young man's treatment was more modern and sophisticated than it would have been in this rural area even a few years ago — partly because of training provided by Nebraska doctors. China's leaders have been open to such help because they want to modernize the country's health care system and reduce the wide gap in medical services that exists between the country's rich cities and its poor rural areas. “Take every disparity in the United States and multiply it times 10, and you've got China,” said Jeffrey Harrison, a family medicine professor at the University of Nebraska Medical Center. But in the past three years, China has poured $125 billion into an overhaul of its health care system. Rural doctors in Xunyang and other remote areas are better trained than they used to be, and rural hospitals are getting better equipment. China's efforts have been aided by UNMC physicians like Harrison who have traveled to China or welcomed visiting Chinese doctors and professors who go to Omaha to learn about primary care medicine and rural health strategies. “We do family medicine and primary care and rural health pretty well,” Harrison said. The UNMC effort in China is partly altruistic, reflecting doctors' desire to educate and improve care. But it also is driven by the self-interest of Nebraska and its university. Deeper ties with China — also including student exchange programs — open the door to joint research projects and other collaboration that help UNMC, university officials say. More broadly, as Nebraska makes more connections with China, they open doors to better trade opportunities in agriculture, irrigation systems and other Nebraska goods and services. In fact, UNMC's work stemmed from contacts made during Nebraska trade missions to China. And during Gov. Dave Heineman's trip there last summer, officials formalized an extensive partnership that has been developing between UNMC and Chinese academic institutions. UNMC officials are good ambassadors for the state's economic development efforts in China, said Joe Chapuran of the Nebraska Department of Economic Development. “It makes us stand out,” said Chapuran, who organizes the state's trade missions. For rural doctors in Xunyang and elsewhere in Shaanxi province in central China, the Nebraska connection involves UNMC doctors who have gone to China to teach about primary care and about developing relationships with patients. In China's health care system, people with ailments typically go to large hospitals, take a number and wait to see a specialist rather than starting with a family doctor. They don't always see the same physician on repeat visits, and they often get little ongoing, preventive care. UNMC has been providing guidance to the Chinese on how to shift to a family medicine approach. The Chinese government has been retraining its rural doctors. Doctors from far-flung parts of Shaanxi province are brought to the capital city of Xi'an for four months of classroom work followed by eight months of observing experienced physicians in modern hospitals. Typically, eight UNMC professors have gone to Xi'an annually since 2008 to give lectures and training in family medicine and rural health care. Starting in 2010, the faculty members also have gone to Shanghai. “The students get very excited because they know they have American doctors to help them,” said Chunli Wu, a nurse who was trained in the U.S. and is coordinator of the rural doctor training program in Xi'an. At first, Harrison said, he and his colleagues thought they would be teaching medicine to the Chinese doctors they instructed. But they were soon humbled to realize that the Chinese were just as proficient as the Americans in medical knowledge. Dang Giangrong, a rural doctor from another city who has been through the program, said the UNMC doctors gave him a new approach. Zhang Li An, who heads the Ganxi Central Medical Care Center in the outskirts of Xunyang, said the retraining efforts have made a difference at his hospital, a nearly four-hour drive from Xi'an on twisting mountain roads. When Zhu Qingli came in with his bronchitis, Zhang said, his doctors talked to him about his lifestyle. They are trying to determine the cause of the illness, not just provide treatment. In addition, he said, they were able to do a chest X-ray using modern equipment that the government upgraded recently. 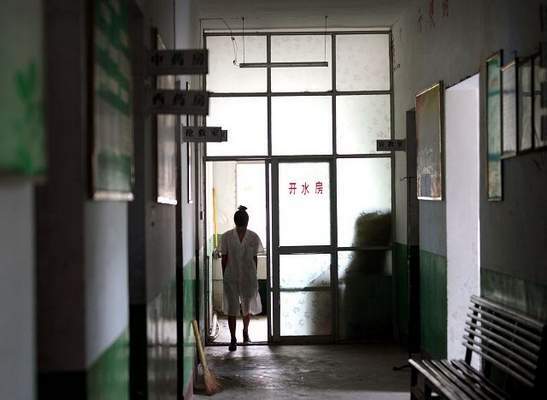 Even so, he said, rural health care in China remains less advanced than in bigger cities. “We still have a long way to go,” Zhang said.